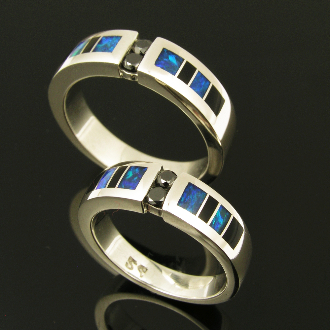 Unique his and hers sterling silver black diamond wedding set inlaid with Australian opal and black onyx. Matching handmade bands feature 2 channel set round black diamonds flanked by alternating onyx and blue-green Australian opal inlay. His wedding ring has 2 black diamonds totaling .16 carats. The ring is 6mm wide and is a size 10. This band is available in other sizes and color combinations by special order. It is hand signed "MMH" by Mark Hileman on the inside of the ring. Her wedding band also has 2 channel set black diamonds totaling .12 carats. The blue-green Australian opal in her ring is a perfect match to the opal in his band. Her ring measures 5.5mm wide and is a size 6 1/2. It is also available in other sizes and color combinations. Opal is the only gemstone known to man to have the natural ability to diffract light. An opal's color is created when the voids between the particles split light entering the stone. The size and alignment of the spheres and voids, as well as the light source, determines the colors produced. To view an opal's color play at its best, the light source must be coming over your shoulder. An opal's color can cover the full spectrum of the rainbow.